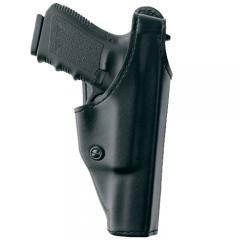 Gould & Goodrich K-Force Adjustable Retention Duty Holster Model K338 FREE SHIPPING! Tension screw lets you adjust for a firm or smooth draw. Hammer strap with thumb break. Sizes for most Auto-Pistols and K frame revolvers. Fits belts up to 2 1/4. ©2002-2019 CopsPlus.com: Gould & Goodrich K-Force Adjustable Retention Duty Holster Model K338 FREE SHIPPING!